Earlier known as Lady Willingdon Park, Lodi Gardens is a captivating park, located in the New Delhi. It lies between the Khan Market and the Safdarjung Tomb. Lodi Gardens present an impressive blend of lush greenery and majestic architectures which belong to 15th and 16th century. Lodhi Gardens offer an ideal setting for family outings as well as a perfect spot for those seeking some peaceful time amid the refreshing nature. Sunset is especially breathtaking at the Lodi Gardens. Adding to natural greenery are the impressive structures of tombs and mosques. Built by Ala-ud-din Alam Shah as a tribute to Mohammed Shah, third emperor of the Sayyid dynasty, this is the earliest of the tombs here. It was built in 1444. Located in the southwestern part of Lodhi Gardens, this tomb can be seen from the road as well. This octagonal shaped tomb has a chamber in the middle which is surrounded by verandah. It has three arched openings. The carvings on the domes along with crowning lotus are worth noticing. It has eight graves while the one in the center is said to be of Muhammad Shah. 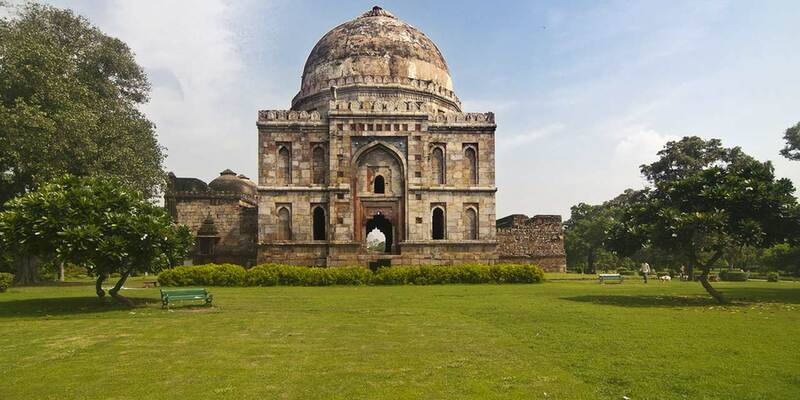 Built by Ibrahim Lodi in 1517, the last ruler of Lodi Dynasty, tomb of Sikander Lodi is located on northwestern corner of Lodi Gardens, on the north of Sheesh Gumbad. It has some similarities with the tomb of Mohammed Shah and Mubarak Shah, although this tomb doesn’t have chhatris. It is surrounded by a square shaped garden. Built in 1490 during the reign of Sultan Sikander Lodi, Bara Gumbad is one of the biggest tombs here and is believed to the gateway for other nearby mosque by some of the historians. It is square shaped tomb with a massive dome. It is located northeastern side of Muhammad Shah’s tomb. The interior of the tomb consists of stucco work and beautiful paintings. Even though there is no grave inside this tomb, it is still believed that someone of high rank, who is still unidentified, must have be buried here. The Bara Gumbad Masjid is located just next to the tomb. Located a few meters away from Bara Gumbad, Sheesh Gumbad presents a mix of Hindu and Islamic architecture. Also known as the glazed dome, owing to its blue tinted ornamentation, this tomb is quite similar to Bara Gumbad in its structure. The dome of the tomb was originally decorated with blue titles while the interior is adorned with floral motifs and inscriptions from Quran. Located on the eastern side of Sikander Lodi’s tomb is the Athpula. It is said to be built during the reign Mughal emperor Akbar. It is a stone bridge consisting of arches and pillars over a small waterway in the garden. Lodi Gardens consists of a rose garden, a lake and a Greenhouse which is in addition to the wide variety of trees and plants. A rich avian fauna can also be spotted here such as babblers, parakeets, mynahs, kites, owls, kingfishers and Hornbills. Lodi Gardens timings are from 5:00 AM to 8:00 PM from April to September. From October to March, the garden is open from 6:00 AM to 8:00 PM. It is open on all days of the week. There is no entry fee and it is open to everyone. Lodhi Gardens can be easily reached by road as well as metro rail. The nearest metro station to Lodhi Gardens are Jorbagh metro station and the JLN metro station. Tourists can also reach here by local city buses, auto-rickshaws and taxis.